I seem to have missed the boat on zines. I was a bit too young to catch its last culturally relevant kick at the can during the Riot Grrrl movement and, moreover, I wasn’t anywhere geographically close to the west coast cities that were known for zine production in the early 1990s. The closest I got was putting together a photocopied, hand-written newspaper with my buddies in grade four called the “You Can’t Do That On Television Times”, which discussed hard-hitting and edifying stories about the television show the paper was named after. It lasted two issues before the “editor”, our teacher, pulled the plug. Now, nearly everyone with an inflated ego and an internet connection can run their own blog (Hey, wait a minute! ), thus, a need for hard copy zines was quelled for the most part. The Internet served to spread information quicker and easier (and reached a larger audience) than a zine ever could. 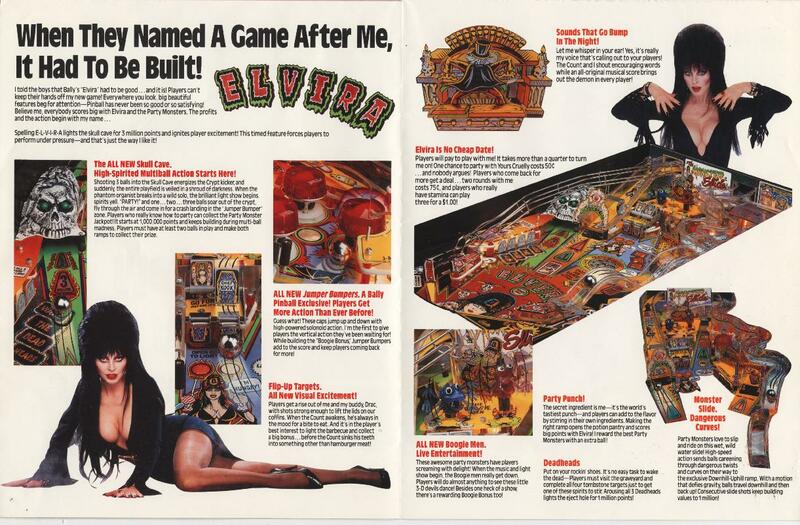 However, the spirit of the self-published, low production publication still lives on–the same way LPs are holding their own against digital music and pinball against console and mobile gaming. Happily, the paths of the zine and pinball cross in a fantastic publication called Drop Target Zine, which exists as part comic book and part magazine, and remains fully dedicated to a deep appreciation of the modern flipper game. Drop Target Zine springs from the minds of Alec Longstreth and John Chad. 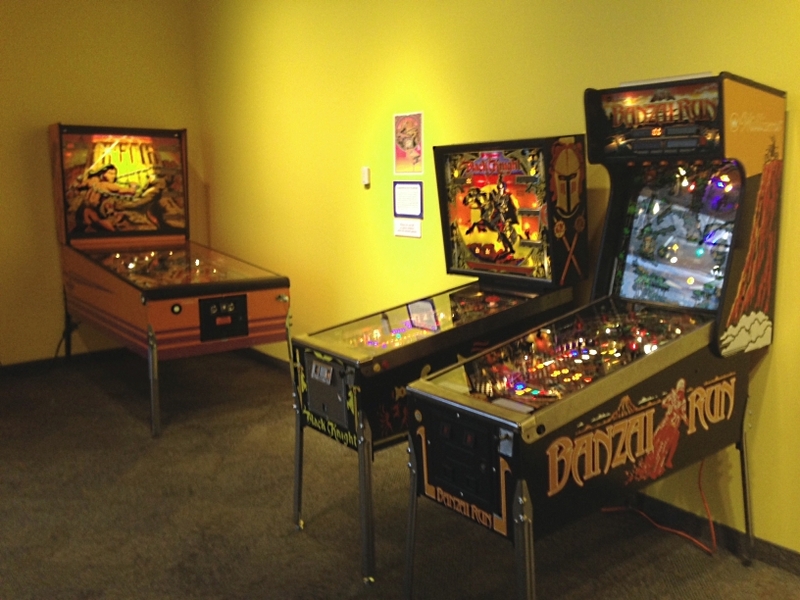 It is a bi-costal collaboration of epic proportions: these men are no strangers to both the self-publishing world and the pinball community. 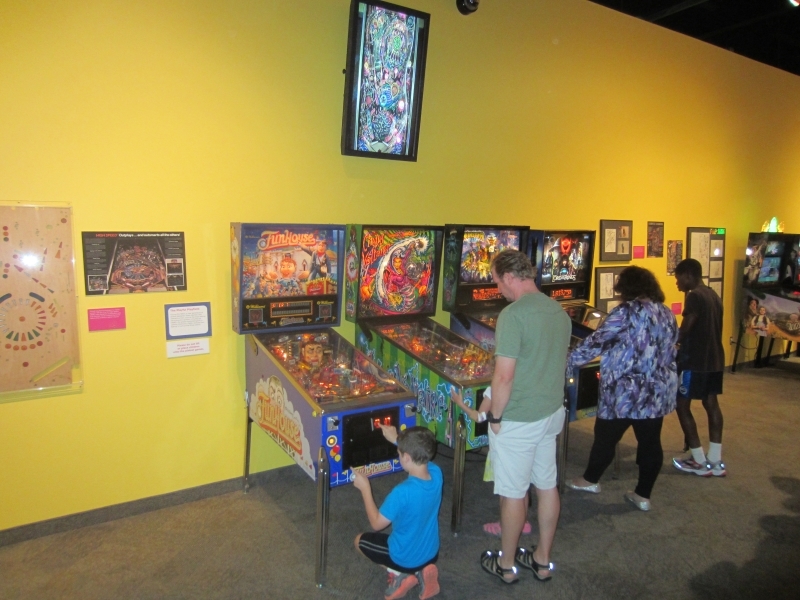 In terms of pinball, Mr. Longstreth’s artistic work can be found frequently on Stern Pinball’s blog and Mr. Chad will be known to the community due to his fantastic (and altogether whimsical) sci-fi designs for the Professional and Amateur Pinball Association. Together they have accounted for five issues of “DTZ”, and have promised a sixth by the end of the summer. Jon Chad, left, and Alec Longstreth, right, in self-portrait, teasing the theme of DTZ#6. Courtesy of Drop Target Zine #5. For those uninitiated, a zine is basically a DIY magazine with limited publication and distribution, and very few frills. Traditionally, the content is photocopied and assembled by hand. Historically, the zine voice is that of the marginalised, ignored or unheard. Images are stolen and appropriated and the articles are typically unpolished manifestos “unfit” for publication in the mainstream media. That being said, the Drop Target Zine isn’t a radical proclamation calling for liberation through riot or pinball players to rise against society and take to the streets–those days of the zine are long past. It is simply a quirky publication filled with great art, interviews and a healthy dose of imagination. It takes the original spirit of the zine and blends it with the polish and organization of a handmade comic book. The California-based Mr. Longstreth publishes his own line of comics entitled Phase 7 and also works as a freelance illustrator, while Mr. Chad lives and works in Vermont, teaching at the Center for Cartoon Studies, and is the creator of the Leo Geo series of comics. 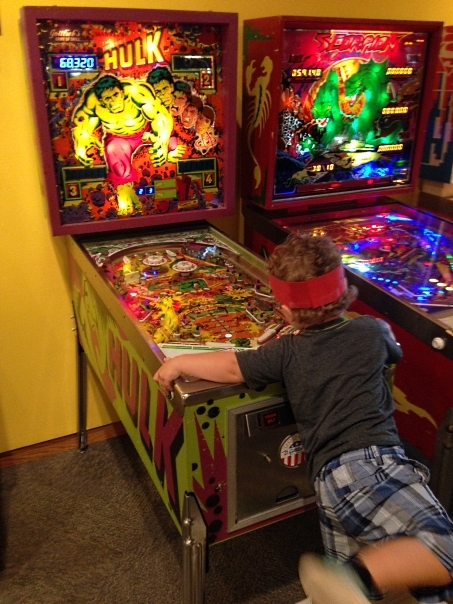 This must be a passion project as both have an appreciation for the silver ball and its place within popular culture. Two games that receive particular attention in the zine and in their online activity are Data East’s Jurassic Park and Williams’ Star Wars Episode I. 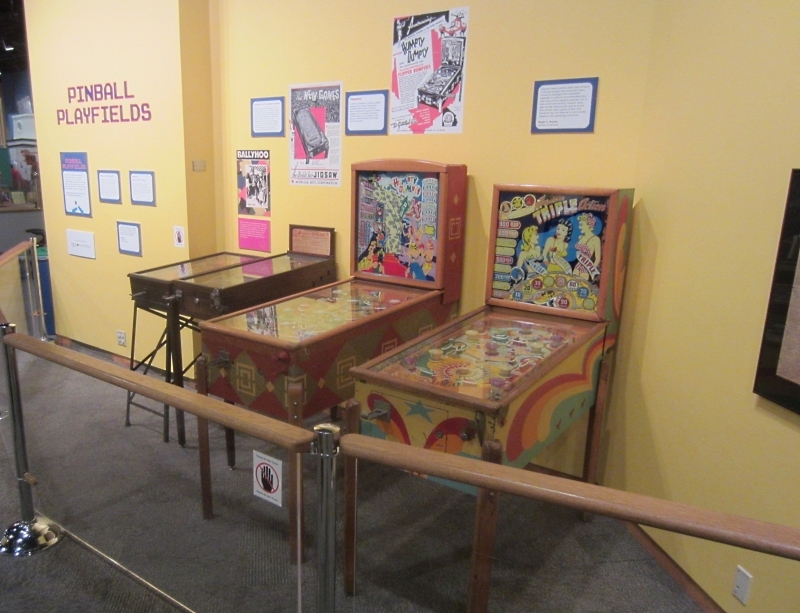 Many of the accounts in the zine, both written and illustrated, are very personal, highlighting shared experiences and their relationship to the world of pinball. Mr. Chad and Mr. Longstreth illustrate themselves constantly throughout the zine, so the heavy hands of the authors/artists are always on display acting as cartoon Sherpas to guide the reader through the pages of the zine. Each 5.5″x8.5″-sized issue of DTZ is focussed in its scope, choosing a topic to explore within its pages. The two issues I’ve chosen to review here are DTZ#4, “The Moves Issue”, and DTZ#5, “The Community Issue”. As such, Issue 4 features interviews with top players Keith Elwin and Bowen Kerins and an illustrated guide to ball control using the flippers. 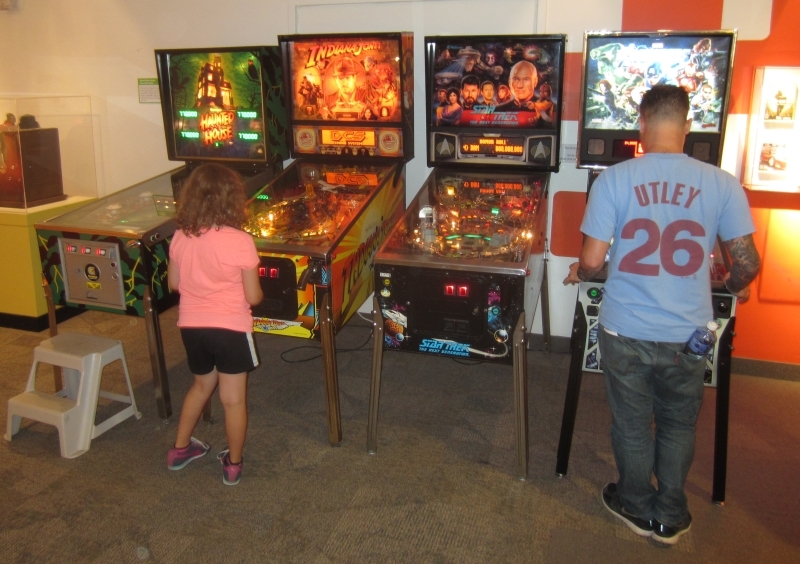 Issue #5 has a feature on PAPA director Mark Stienman and two longer comics about competition and the shared pinball experience. 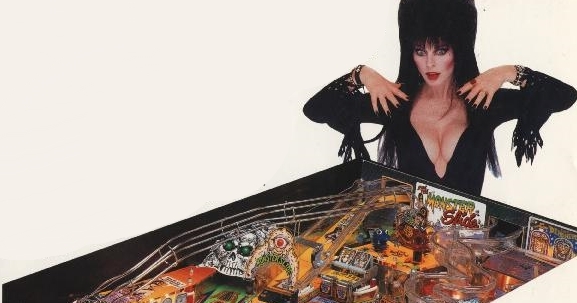 Each issue also has recurring features: Pinhalls spotlights great places to play pinball across America and the Replay Review puts the focus on one particular machine and its rules (in Issues #4 and #5, the featured games are Jurassic Park and the Addams Family respectively). 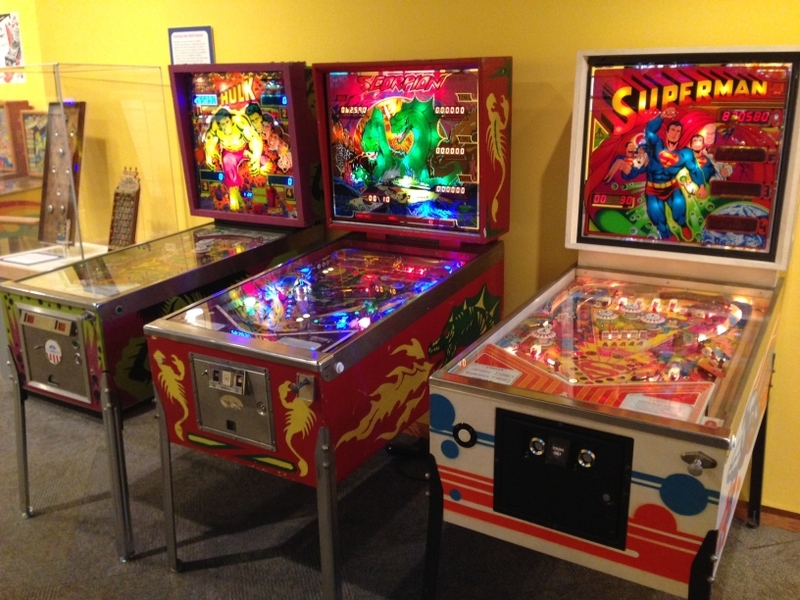 You may be underwhelmed by such features by reading about them here, as there are countless trip reports and an endless number of text and video reviews of popular machines like the Addams Family available if you know where to look. 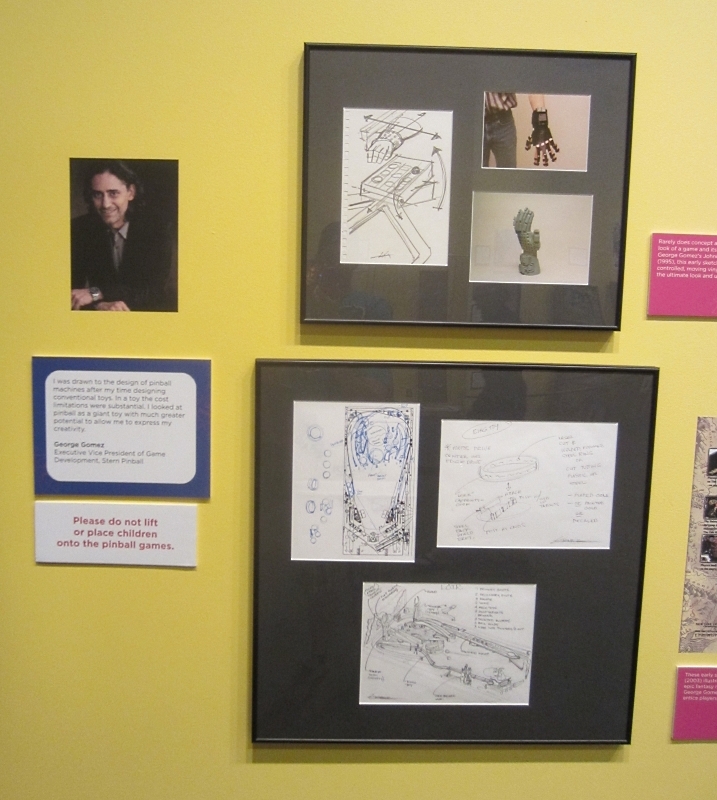 However, Pinhalls is usually accompanied by comic interpretations of the author’s visit to the featured location and the reviewed machine is met with the artist’s individual artistic interpretation, which spices up what would normally be a mundane text rundown of rules. The artist’s touch puts a fresh spin on the sometimes stale information. 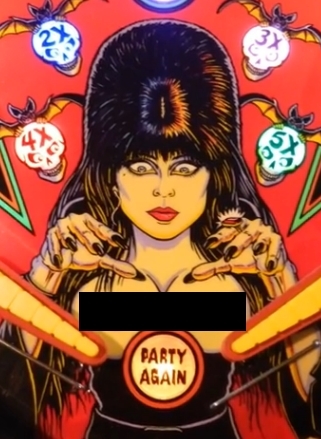 The Addams Family review is fantastically illustrated by Mr. Longstreth, and includes his own interpretation of the entire TAF playfield, while the body of text is showered with individual illustrations of TAF’s unique playfield toys. 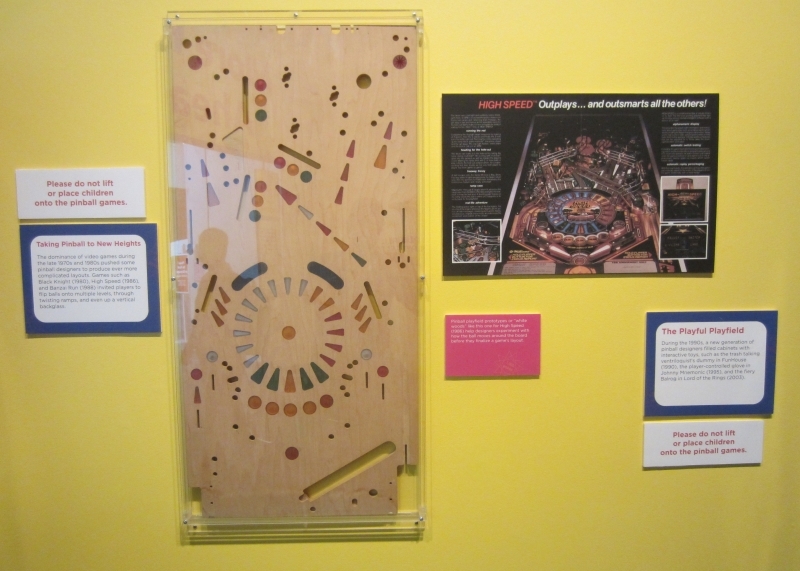 Mr. Longstreth’s interpretation of the TAF playfield. Courtesy of DTZ#5. The standout feature of the zine is Dream Machines, where Mr. Longstreth, Mr. Chad and a few special guests create original pin tables that spring from their own imaginations. Each table is drawn to scale with a complete art package and, unbelievably, includes a complete and detailed ruleset. The magazine is printed in black and white, but each month, one dream table is given the colour treatment and is featured in the centre gatefold. Mr. Longstreth has provided a Harry Potter themed table for every issue thus far, and in an interesting spin, they are all based on the original J.K. Rowling books, not the Warner Brothers blockbuster movies. 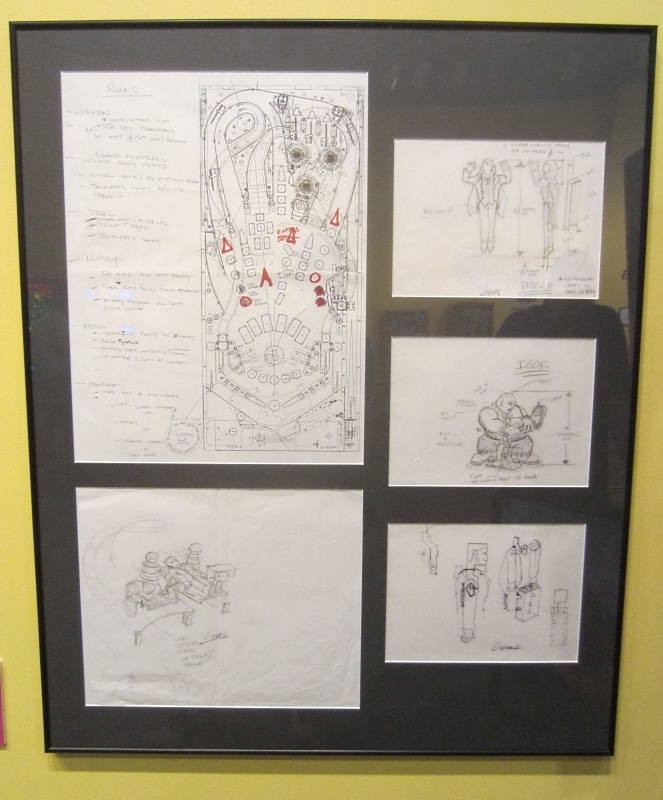 Other dream tables of note include Groo the Wanderer, Pee-Wee’s Big Adventure, Conan the Barbarian and Inspector Gadget. Art and rulesets remain completely true to the licence and in most cases the technology remains true to the era in which the machine would have been produced given its year of release. Mr. Chad’s fictional Conan the Barbarian design. Courtesy of DTZ#4. 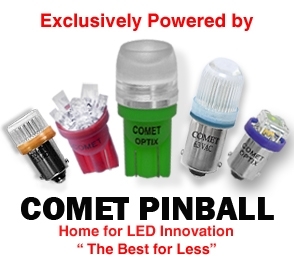 With the lack of printed pinball “journalism” available to the community, save for Pinball Magazine which arrives only once per year and the recent appearance of a few special blogs (*wink*), the zine format is perfectly suited for a niche hobby like pinball. The $5USD cover price is a steal when you realize the work that goes into putting together each issue. 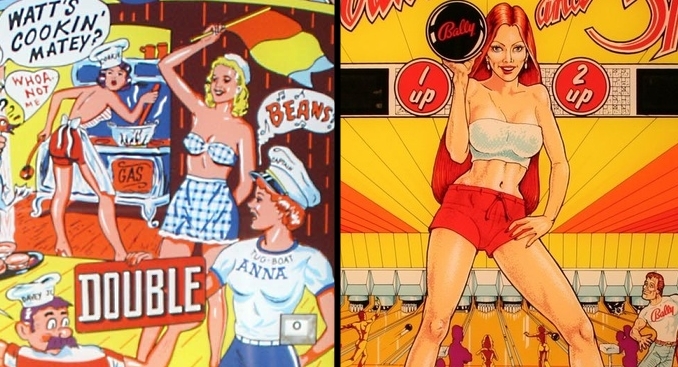 My only gripe is that DTZ’s frequency mirrors that of Pinball Magazine–each issue is released on a yearly basis (approximately). However, its infrequency only adds to the charm of the publication and makes its arrival even sweeter. Reading the zine, you get the feel that it was hand-made specifically for YOU: it is an extremely personal experience in both production and reader reception. In a hobby where the multiplicity of online voices can be frustrating and condescending (and sometimes downright annoying), it is refreshing to sit down to with an issue of this zine and bask in the skilfully drawn comic panes and printed words. Due to the limited run of the zine and its cult popularity, the first run printings of each issue, save for DTZ#3, are completely sold out. A second run, which lacks the screen-printed cover and colour Dream Machine centerfold (both reproduced in black and white), are available for $4USD plus shipping directly from the DTZ blog. If you are so inclined, a five-pack of mini-buttons with original DTZ art is also available for $3USD plus shipping. First print issues of Drop Target Zine #4 and #5. The covers are beautifully screen-printed. Nice touch! 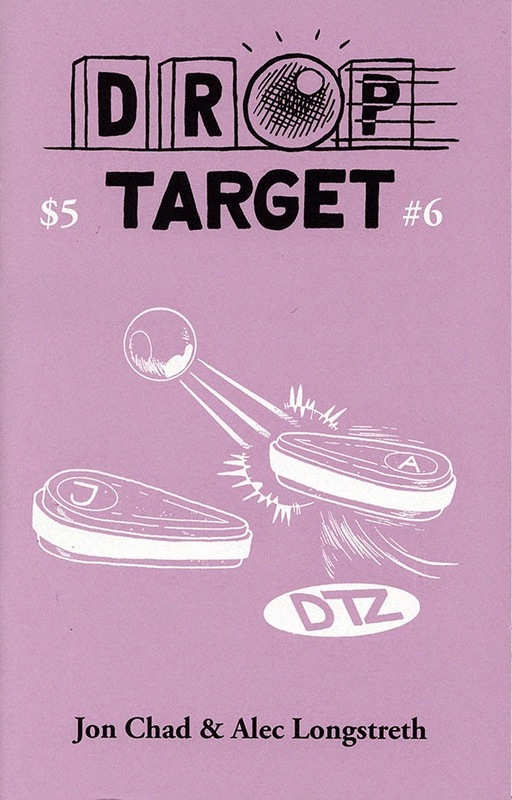 I highly recommend Drop Target Zine to anyone who wants to immerse themselves in the honest and simple roots of playing and experiencing the game of pinball. Every time I pick up an issue of the zine, I’m reminded of my childhood, where weekend trips to the arcade and reading comic books were my only concerns. It is a nice throwback to memories of those times, now that I have a career and family, leaving little time for such childhood thrills. It also reminds me how much fun PLAYING these machines can be, seeing as much of my free time, and probably yours as well, is spent modding, fixing and maintaining them. 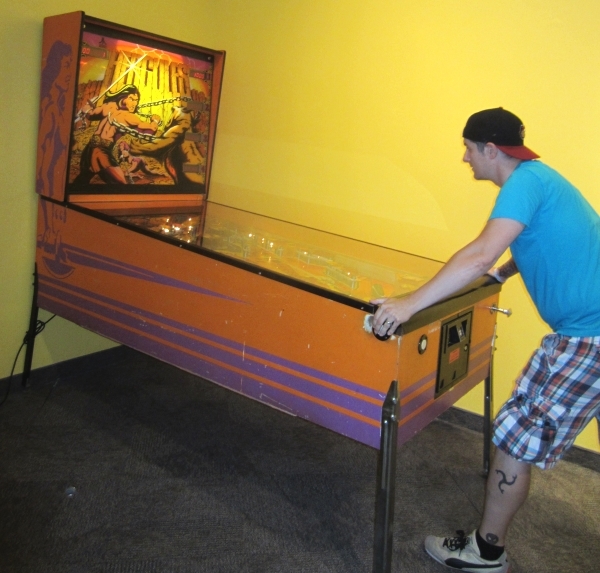 Mr. Longstreth and Mr. Chad have expertly blended the art of the zine with a passion for pinball. The result is something that can be embraced by the community at large. Categories: Feature | Tags: Addams Family, Alec Longstreth, Drop Target Zine, DTZ, Jon Chad, Jurassic Park, Star Wars: Episode I | Permalink.